Judie went into a Hospice On September 11, 2009. She has terminal lung cancer. I married Charles VanOver in 1957. We spent our early lives in the St. Louis area with Charlie working for McDonnell Aircraft before he joined Burger Chef, where he remained as a supervisor for 6 years. I worked in the hospitality (hotel) field for several years as a reservations manager. abdominal aortic aneurysm, and that was the end of our restaurant career. We are now both semi retired. Presently, Charlie undergoes kidney dialysis treatment and is on the list to receive a kidney transplant. He works part time as a bookkeeper and I am a part time receptionist for a small chiropractic office after spending 5 years as a secretary/receptionist for a large Ford dealership in the heavy trucks dept. We have three wonderful sons. Michael, 43, is a licensed police officer in the state of Illinois and works for the Will County Public Defender's office as an investigator. He and his wife CeCe live in Shorewood, a suburb of Juliet, where she is a psychologist, specializing in children. She works in the Psyche Dept. of St. Joseph's Hospital., and has her own private practice. Between them they have five children. Sara, 13, is Mike's daughter. Matthew, 18; Daniel, 16; Andrew, 13 and Jillian, 13 (twins) are CeCe's children. Matthew and Daniel live with their father, so Mike & CeCe have three 13 year old kids at home. Don't you just envy them?? They really are great kids. Timothy, 38, has been married to Keli for 19 years and they live in Chino Valley, AZ, about two hours north of us. They have two wonderful kids: Matthew, 14 and Rebecca, 10. Tim has owned an auto parts store for years, but will probably give that up soon because the area is becoming saturated with the "Big Boys" - i.e. NAPA, Auto Zone, etc. Keli is a medical biller for a private practice and is somewhat of an expert in her field. Medical billers from all around call her for advice when they are having trouble collecting from insurance companies. Mark, 29, is single, however he has scads of children. He is an advance placement Social Studies teacher in a high school in the Tempe, AZ school district. These classes, all college level, are much harder than "Honors". He has been to Europe several times, as a chaperone when his students take their Euro trip. 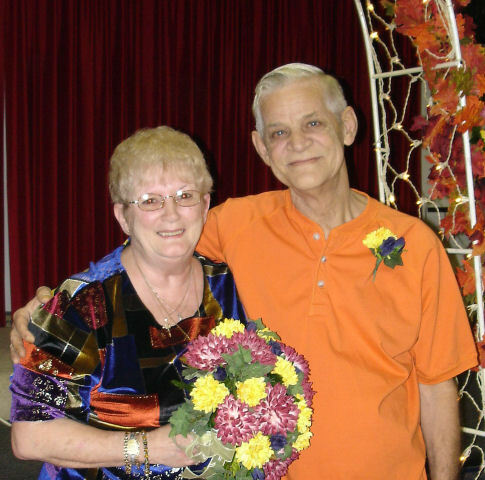 Jerry and I were married before the presence of 81 guests including children and grandchildren on Oct. 22, 2005. His name is Jerry Lee Carlson. I am now Judith VanOver-Carlson. Jerry is a widower I have known for several years. He was a baker by trade but is now retired. We are living happily ever after. Between us we now have 7 children and 17 grandchildren living all over the place. He has 3 brothers and 3 sisters living and I have NONE. Just a little brat only child. Charlie, as well as Jerry's deceased wife, Sherry, will always be a huge part of our lives. One of the wonderful things about our relationship is that we can talk to each other and anyone else about Charlie and Sherry and there is no jealousy, etc. A very important thing when you really think about it. They were part of our lives for many years and you don't just cut them out. This also makes things much easier for our children and grandchildren. Jerry still has some young grandchildren and some are already calling me Grandma or Grandma Judie. My grandchildren are all older and I am pretty sure they will never call him Grandpa, but that is OK. We are looking forward to the reunion as long as his health holds up. He is doing pretty good, but still has some problems, some that will never go away but can be controled by meds. The main thing is that no matter what happens or how long we have together, we love each other and wanted to be married-now we are. He is a wonderful man who has had a lot of sadness in his life. He treats me like I was some kind of princess, with such love and kindness. He is very well though of, in the circle of friends that we have in common. Not one person had a bad word to say about him when they realized how serious we were and trust me, these people would not hesitate to tell me or him if there was something we should be aware of. Remember we knew each other for three years and he has watched me and just about every part of my personality for those years. He was always very quiet - but once I really got to know him that changed and he speaks his mind which is something that really pleases me. We have had long, long talks about each other, our kids, etc. He comes from a large family with several brothers and sisters. One of his sisters passed away a few years ago and he has one brother who is pretty sick - the rest are healthy and kicking. Kind of different from me - the only child . I love him, more than I ever thought I could love anyone after Charlie and will cherish whatever time we have together. He's really great and I am so very happy and people that know me well out here keep telling me how much better I look - happy, younger, etc. That's because of how Jerry treats me.